At the age of twelve Beethoven was a promising keyboard player and a talented pupil in composition of the court organist Christian Gottlob Neefe (17481798). He even filled in as church organist when Neefe was out of town. In 1783 Beethoven's first published work, a set of keyboard pieces, appeared, and in the 1780s he produced portions of a number of later works. In 1787 he traveled to Vienna, Austria, apparently to seek out Wolfgang Amadeus Mozart (17561791) as a teacher. He was forced to return to Bonn to care for his ailing mother, who died several months later. His father died in 1792. In 1792 Beethoven went back to Vienna to study with the famous composer Joseph Haydn (17321809). Beethoven was not totally satisfied with Haydn's teaching, though, and he turned to musicians of lesser talent for extra instruction. Beethoven rapidly proceeded to make his mark as a brilliant keyboard performer and as a gifted young composer with a number of works to his credit. In 1795 his first mature published works appeared, and his career was officially launched. Beethoven's two main personal problems, especially in later life, were his deafness and his relationship with his nephew, Karl. Beethoven began to lose his hearing during his early years in Vienna, and the condition gradually grew worse. So severe was the problem that as early as 1802 he actually considered suicide. In 1815 he gave up hope of performing publicly as a pianist. After 1818 he was no longer able to carry on conversations with visitors, who were forced to communicate with him in writing. The second problem arose when he became Karl's guardian upon the death of his brother in 1815. Karl proved to be unstable and a continuing source of worry to an already troubled man. Beethoven's deafness affected his social life, and it must have changed his personality deeply. In any event, his development as an artist would probably have caused a crisis in his relationship to the musical and social life of the time sooner or later. In his early years he wrote as a pianist-composer for an immediate and receptive public; in his last years he wrote for himself. Common in Beethoven biographies is the focus on Beethoven's awareness of current events and ideas, especially his attachment to the ideals of the French Revolution (178999; the revolt of the French middle class to end absolute power by French kings) and his faith in the brotherhood of men, as expressed in his lifelong goal of composing a version of "Ode to Joy," by Friedrich Schiller (17591805), realized at last in the Ninth Symphony. Also frequently mentioned is his genuine love of nature and outdoor life. His Middle (Heroic) period began shortly after Beethoven's personal crisis brought on by his recognition of encroaching deafness. It includes large-scale works that express heroism and struggle. Middle-period works include six symphonies (Nos. 38), the last three piano concertos, the Triple Concerto and violin concerto, five string quartets (Nos. 711), several piano sonatas (including the Moonlight, Waldstein and Appassionata sonatas), the Kreutzer violin sonata and Beethoven's only opera, Fidelio. In 1962, Walt Disney produced a made-for-television and extremely fictionalized life of Beethoven entitled The Magnificent Rebel. The film was given a two-part premiere on the Walt Disney anthology television series and released to theatres in Europe. It starred Karlheinz Bohm as Beethoven. 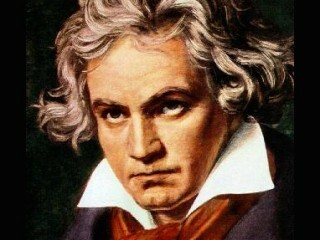 View the full website biography of Ludwig Van Beethoven.